Egyptians at the Seeds of Peace camp in Otisfield have been trying to stay abreast of the latest developments, including Friday's clashes. OTISFIELD — Nearly two-dozen Egyptians who arrived in Maine last month at a special camp aimed at helping Israeli and Arab teens overcome their differences will return home to a country that ousted its leader following the largest demonstrations seen in their homeland. From more than 5,000 miles away, Egyptians at the Seeds of Peace camp have been trying to stay abreast of the latest developments, including Friday’s clashes. So far, the violence has killed 30. Many campers participated in the Arab Spring demonstrations two years ago, but were left to watch as Egyptians took to the streets again last week, leading to the ouster of President Mohammed Morsi. On Friday, Morsi loyalists fought back, leading to the bloody clashes. Counselor Mostafa Ismail, 22, from Cairo, said people were unhappy with the presidential ballot choices after the Arab Spring demonstrations led to the election of Morsi. He said the country now needs to take a deep breath to ensure history doesn’t repeat. “Egypt is still a baby and the best way to succeed is to take it slow – baby steps. Because if you try to rush it, it will fall,” Ismail said during a break. Nestled in the Maine woods, Seeds of Peace is now in its 21st year of bringing together teens from countries that are enemies. There are currently more than 200 campers including Egyptians, Jordanians, Israelis, Palestinians, Pakistanis, Afghans and Americans. The camp founded by foreign news correspondent John Wallach, who died in 2002, is always held against a backdrop of some sort of events unfolding in the Middle East. But this session marked the first real-time change in leadership in the 16 years that Executive Director Leslie Lewin has been attending the lakeside retreat. “I don’t think we’ve ever had a change of leadership while the kids were here, and certainly not in the manner we saw in Egypt over the past couple of days,” she said. Banned from using computers or smartphones, campers awake every day and rush to the camp telephones to check on relatives and to read news stories posted by counselors. Laila, a 17-year-old returning camper from Cairo, said her parents, brother and sister participated in the protests that led to Morsi’s departure. “It is frustrating to be here while everything is happening in Egypt. I really love being here and wanted to come back for such a long time. But I would also have liked to be with my family,” she said. Sixteen-year-old Habeeba, another returning camper, said the Arab Spring fueled an ongoing push for change in her home country. “It’s one big ongoing revolution. We’re trying to change things,” she said. Seeds of Peace allows teenage campers to speak to the media and to be photographed. But it doesn’t allow their full names to be released to help to protect their identities to allow them to speak freely without the fear of reprisals in their home countries. Protected by state troopers, they spend three weeks swimming and canoeing, playing sports and engaging in intense dialogue about war and peace with bunkmates from countries they have been taught to regard as the enemy. A ropes course and other activities teach teens to trust each other. 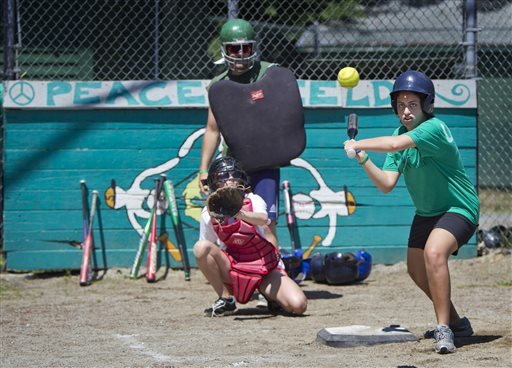 On Friday, boisterous campers played softball and soccer with teams from a nearby camp. In between innings, the Seeds of Peace campers belted out a rendition of “Sweet Caroline,” a tradition at Boston Red Sox games. For the Egyptian campers, however, the homeland was never far from their minds. They’ll be returning home to seek a peaceful political change in addition to trying to facilitate peace between Israelis and Palestinians. Monica Baky, 21, another counselor from Cairo, said peace will come as Egypt solves its internal problems, including restoring faith in government and improving the economy.